Forests are perpetual losers at the Olympics, and that’s unlikely to change anytime soon. For the upcoming winter games in PyeongChang, South Korea, a swath of virgin forest was razed on Mount Gariwang to accommodate ski runs. Tropical timber sourced from Malaysia is being used to build the New National Stadium for the 2020 games in Tokyo. For the 2022 Winter Olympics in Beijing, a ski run is set to wipe out part of the Songshan National Nature Reserve. And let’s not forget the 240 acres of Atlantic Forest that were leveled for the 2016 games in Rio de Janeiro to make way for a golf course, or the new highway cut through British Columbia’s North Shore Mountains to improve traffic flow for the 2010 games in Vancouver. Activists have protested such environmental destruction, and frequently the country’s organizing committee, and by proxy, the International Olympic Committee (IOC), have found ways to justify it—despite a paragraph in the Olympic Charter that states that the IOC’s role is to “encourage and support a responsible concern for environmental issues.” (Earther reached out the IOC for comment, but they did not reply.) The damage is often permanent and irreversible, threatens endangered plants and animals and, in some cases, displaces or causes conflicts with indigenous people. “The IOC talks green games, but walks to a very different ethical metric,” Jules Boykoff, chair of the Department of Politics and Government at Pacific University in Oregon, and the author of several books on the Olympics, including Power Games: A Political History of the Olympics, told Earther. In South Korea, protesters raised concerns for years about the impending destruction of the forest on Mount Gariwang in the Wonju District to make way for the Jeongseon Alpine Centre. The 500-year-old forest had been designated by the South Korean Forestry Service as a “Protected Area for Forest Genetic Resource Conservation” and was home to a number of rare plants and the largest grove of wangsasre trees, a variety of birch found only on the Korean Peninsula. 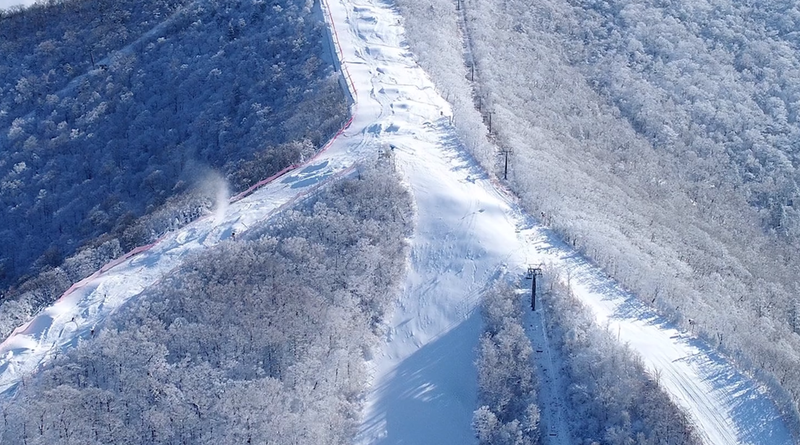 In 2014, South Korean environmental groups wrote a letter to the IOC imploring them to protect the forest and consider using the nearby Yongpyong Ski Resort, a pre-existing ski hill certified by the International Ski Federation. The activists launched a petition calling for PyeongChang’s organizing committee to stop the destruction and even met on the mountain to block the bulldozers, temporarily stalling deforestation. A similar circumstance is unfolding in China, where a proposed alpine ski route for the Beijing 2022 games is being planned within the Songshan National Nature Reserve, located northwest of the city. Although a ski resort in the neighboring Hebei province would work just as well, the borders of the reserve are being expanded to reduce the impact of the ski park on its ecology, reports Nature. For the upcoming Tokyo games, environmental and human rights advocates have been raising alarms about the use of tropical timber to build the New National Stadium and other Olympic facilities. Japan is the largest importer of plywood from tropical forests, reports Global Witness, an international nonprofit that serves as a watchdog for natural resource exploitation. Half of the tropical plywood used in Japan comes from the Malaysian state of Sarawak on the island of Borneo, which has one of the highest rates of deforestation in the world and a high risk of illegal logging. The wood is used, not for decorative purposes, but to create concrete forms, the disposable molds built to shape concrete into wall, supports or other structures, Hana Heineken, a Senior Advisor at the Rainforest Action Network, told Earther. “Japan’s use of tropical timber is a huge cause of deforestation in Southeast Asia,” said Heineken. Clearcutting in these biologically diverse areas threatens species and paves the way for palm oil plantations. Indigenous communities in Sarawak have been fighting the Sarawak government and logging companies for decades over the issuance of timber licenses and the failure to respect their customary rights. By the end of 2014, the Malaysian logging company Shin Yang, which also runs palm oil plantations, was decimating a sensitive area called the Heart of Borneo at a rate of over 40 soccer fields a day, Global Witness found. The Tokyo-based Taisei Corporation, contracted to build the New National Stadium, has also been linked by independent investigations to wood sourced from Sarawak, according to Heineken. Before construction of the stadium began, 44 environmental and humanitarian agencies, including Rainforest Action Network, sent a letter to the IOC warning them that illegal and unsustainable rainforest timber could be used to construct the New National Stadium and other facilities. Shortly after construction started, environmentalists scouting the site spotted tropical plywood sourced from Sarawak and supplied by Shin Yang. “Tokyo 2020's Timber Sourcing Code makes a glaring exception for concrete formwork plywood with respect to sustainability and human rights. It was a major giveaway to Japan’s unsustainable construction industry at the cost of Asia’s last remaining rainforests,” said Heineken. As it stands now, the IOC has little authority over a city’s local organizing committee, which ultimately plans the event, Jean-Loup Chappelet, professor of public management at the University of Lausanne, in Switzerland, told Earther. Even if the IOC is dissatisfied with the way a host city has prepared for the games, he says, they have no built-in mechanisms for enforcing adherence to the Olympic Charter. “The only thing they can do if they’re not happy is to withdraw the right to organize the game, which is like [dropping] a nuclear bomb,” said Chappelet. But the IOC could include more enforcement systems into the contract they make with the host city, he added. That contract is binding and signed by everyone. Those who break it could be fined. Boykoff suggested a similar solution. “The IOC could insist that host cities prioritize their ecological promises, but instead they look the other way, time and time again,” he said.